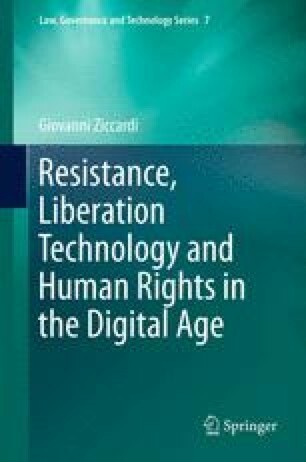 In this Chapter are drawn conclusions concerning: (i) the critical relationship between the use of technologies and the actions of political and social activism, and (ii) how technologies are closely related to the protection of human rights. Leaving aside all local situations addressed in the previous Chapters, the Author draws some basic guidelines that address the issues of the use of technology as a tool for rebellion, the relationship between the activities of dissidents and the digital world of hacking, the relationship between Internet and law (and between law and freedom), to identify some useful interpretative guidelines to develop future research. The first Section of the Chapter deals with human rights protection in the digital era; the second Section analyses information and communication technologies thought as “antibodies” against repression and censorship; the last part deals with digital dissidence and its relationship with the hacking tradition. Benkler, Yochai. 2012. Hacks of Valor. Why anonymous is not a threat to national security. http://www.foreignaffairs.com/articles/137382/yochai-benkler/hacks-of-valor. Accessed 16 June 2012. Joyce, Mary. 2009. An introduction to digital activism. http://www.slideshare.net/MaryCJoyce/introduction-to-digital-activism. Accessed 23 Nov 2011. Pattaro, Enrico, and Giovanni Sartor. 2002. Norms, laws and the internet. http://www.ieid.org/congreso/ponencias/sartorpattaro.pdf. Accessed 14 Nov 2011. Sartor, Giovanni. 2010. Human rights and the future of the information society. http://papers.ssrn.com/sol3/papers.cfm?abstract_id=1707724. Accessed 3 Sep 2012.